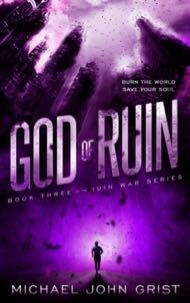 God of Ruin is a Hard SF thriller, Book 3 in the Ruin War trilogy. Your heart is the door into hell. In the destructive struggle for the Aetheric Bridge, elite Graysmith Ritry broke his soul into seven constituent parts. Now those parts roam the world blinded by loss and new addictions, mopping up holdouts from the war with King Ruin. But the real war has only just begun. From the ashes of King Ruin’s defeat a god-like power rises, with a solitary decree- an unstoppable flood is coming, to wash everything clean. And Ritry is a soul divided. How can he possibly stand? An all-powerful god crushes the shattered soul of Ritry in the blazing heart of a star.